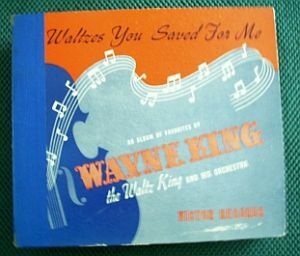 Here is an album of three double sided 78 RPM records by Wayne King. This was a four record album, but one of the records is missing. Condition is very good with no surface scuff marks or scratches. The center holes are in excellant good condition. The spine is in good condition with only minor scuffs and small tear at the top and bottom.